Posted on Sunday, September 29th, 2013 and is filed under National News. You can follow any responses to this entry through the RSS 2.0 feed. 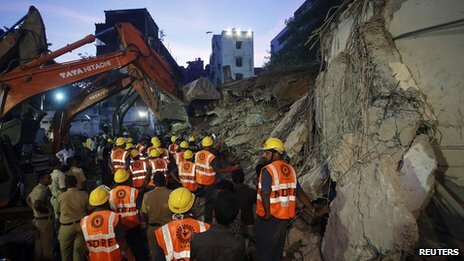 MT NEWS: At least 42 people are now known to have died when a four-storey residential building collapsed in the western Indian city of Mumbai. Some 33 survivors have so far been pulled from the rubble of Friday’s disaster, some with serious injuries. Between 83 and 89 people were in the building near Dockyard Road in the east of the city when it collapsed. 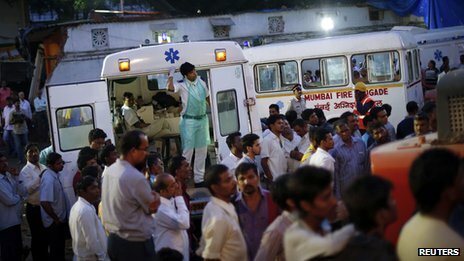 The collapse is the latest in a series in Mumbai. Poor construction practices have been blamed in earlier incidents. As rescuers equipped with cranes searched the rubble, a young girl was dragged alive from the the ruins on Friday, nearly 12 hours after the collapse, and a 50-year-old man was pulled out on Saturday with serious injuries. “Five members from my family were trapped inside. So far, two have been rescued. I am praying to God others will also come out alive,” Preeti Pawar, among crowds of relatives and onlookers outside the ruins, told Reuters news agency. Rescuers worked for six hours to free the survivor found on Saturday. The man’s leg had been crushed by a wall. Alok Awasthi, local commander of the National Disaster Response Force, said rescuers had not found signs of life recently but vowed to continue the search. The building had been home to more than 20 families of employees of the Municipal Corporation of Greater Mumbai. Officials say the municipality asked the residents to vacate the property earlier this year. 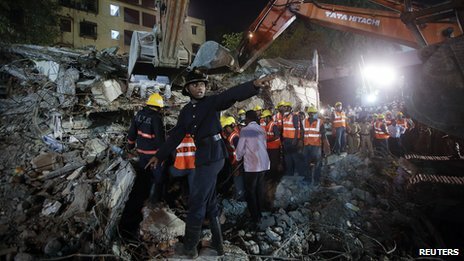 More than 100 people have been killed in five building collapses in Mumbai between April and June alone. And between 2008 and 2012, there were 100 building collapses in the city in which 53 people died and 103 others were injured, authorities say.